Wouldn't it be great if dressing your child were as easy as playing dress-up? You'd pick an outfit you love, regardless of how impractical it is (lacy frills, hand-wash only), and your little one would stay beautiful and comfortable all day long. Of course, kids are known to play rough and get messy, and if they don't like the way something looks or feels . . . Well, they're not going to be quiet about it. But that doesn't mean you can't have fun dressing them up — and keep them happy too! As you head into the back-to-school shopping season, keep these six fashion rules in mind. Think fuss-free: Whether they're preschoolers still honing their potty routines or 8-year-olds who are always late to the school bus, the easier clothes and accessories are to get on and off, the better. That means stocking up on pants with slip-on waists, jackets and shirts with snaps instead of buttons, and Velcro-strap shoes. Dress a leader, not a follower: Blending in is Boring with a capital B! To ensure your little one stands out from the crowd, shop clothes that are made to be as unique as she is. Check out the vibrant colors, artful details, and cheeky style of Mini Boden, and visit the brand's interactive back-to-school website, where you'll find A+ outfit ideas, hands-on crafts, videos, and more. Layer it on: Outwit unpredictable thermostat fluctuations in the classroom by outfitting your child with his or her own temp-control system, like a flannel over a t-shirt that can be easily removed if it gets too stuffy. Spill during art class or splat over lunch? There's no need for tears when she can simply take off her cardigan and show off the adorable dress underneath. Quality counts: Don't be afraid to spend a little extra for well-made items that fit your child's habits and will stand the test of time: playground-proof pants that are quick-drying, fully lined, and packed with pockets for supplies; jeans with appliqué-reinforced knees that are both cute and practical; or hard-wearing tees that go with everything in his closet. Keep 'em comfy: Too-tight fits and itchy fabrics are instant concentration-killers. Jeans with a hint of stretch, supersoft 100 percent cotton shirts and tees, and adjustable waistbands always make the grade. 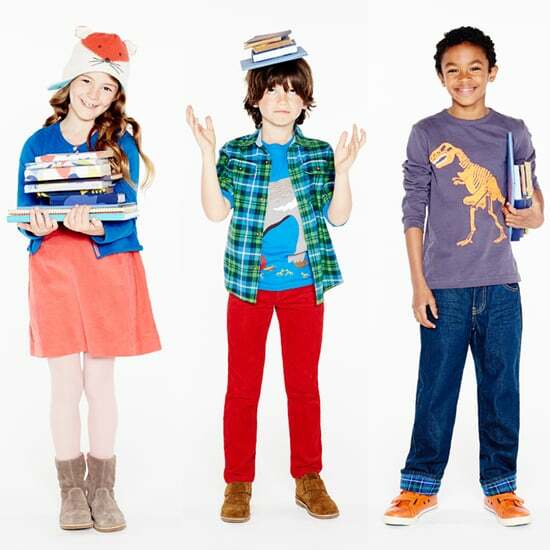 Be kid-friendly: Picking the right clothes for your children is not unlike finding the perfect friend or study buddy. Choose items you know they'll want to "hang" with by paying attention to fun details like zany patterns, colorful characters, heart-shaped pockets, and cool graphics.